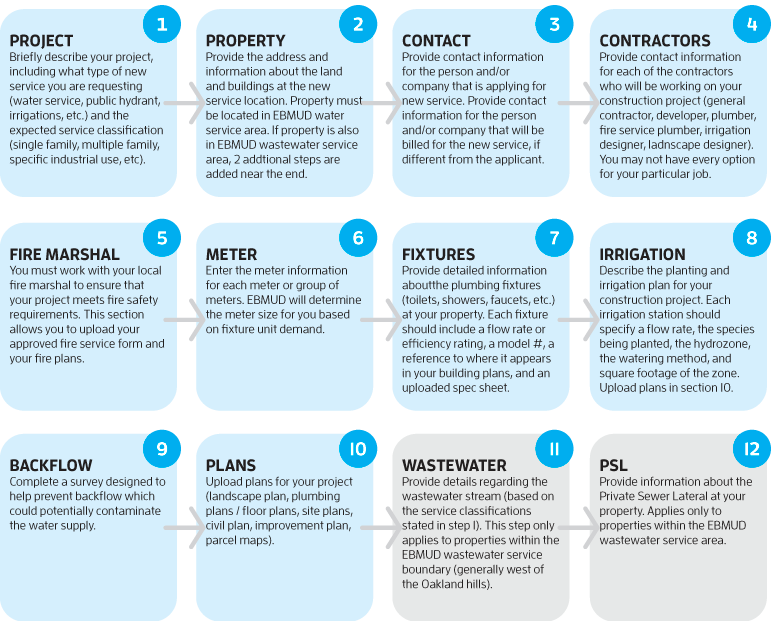 Putting new pipes and meters in the ground requires EBMUD to collect many different types of information which will typically come from many different sources. Because of this, it is very unlikely that you will be able to complete the application from start to finish in one sitting. Here's our recommended approach. Our online form is designed to allow you to skip parts that you don't yet have answers to, and return later to add the infomation as it becomes available. Here are the steps of the submission process to help you get your bearings. You will be prompted to return and complete sections which are incomplete. You may take your time and do this over the course of several days or weeks. Your work-in-progress application(s) will be saved and available for you to return to work on at your convenience. Once all sections are completed, you will be asked to acknowledge a series of terms, and then you may submit the application to EBMUD.